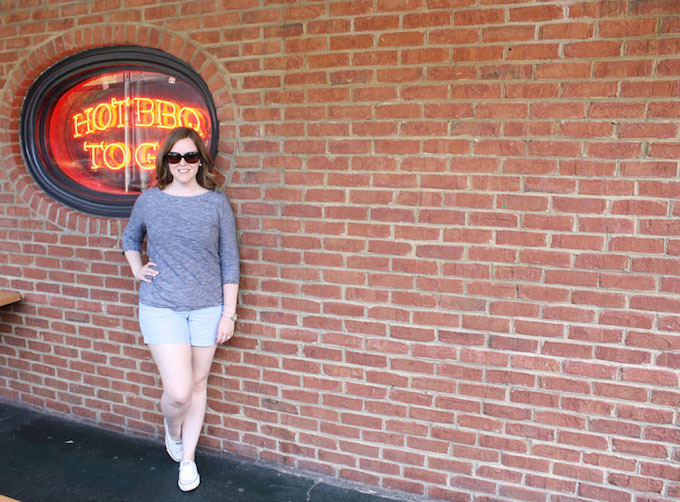 As promised, I wanted to share a little bit more about the Sunday portion of our Atlanta staycation. 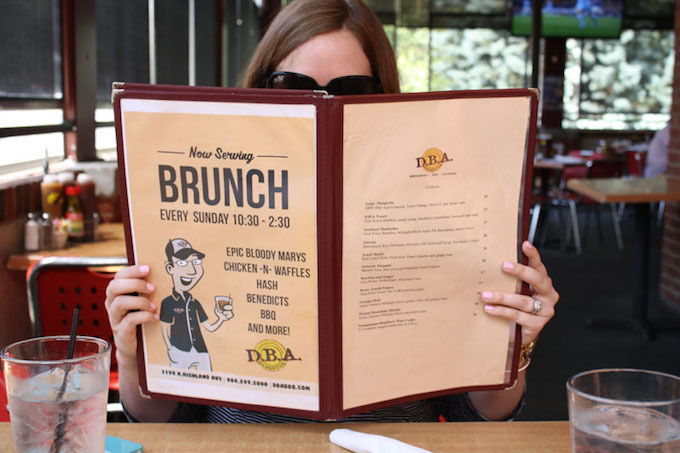 For brunch on Sunday, we had the pleasure of visiting Virginia-Highland's neighborhood staple: DBA Barbecue. Started in 2009 by Matt Coggins, DBA Barbecue has made a name for itself in and around Atlanta bringing the very best in BBQ meats and delectable sides to our city. 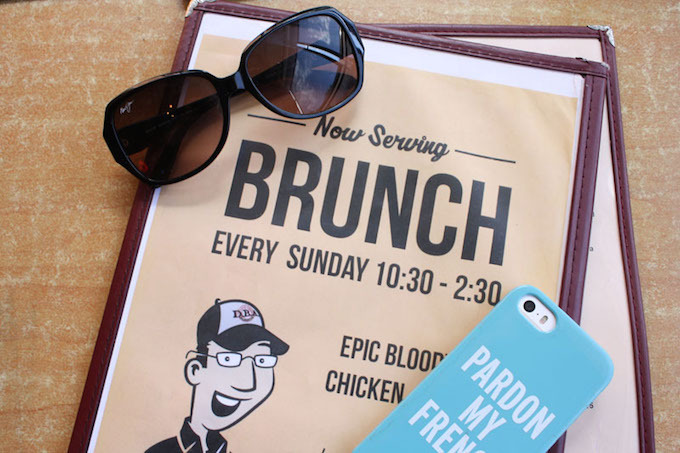 But it wasn't until recently that DBA really expanded its wings and started offering brunch...and if you've never tried BBQ variations for brunch, you're in for a treat. DBA Barbecue is located in the heart of the Virginia-Highland neighborhood which is worth a day of exploration in and of itself. Plus, the shopping center that the restaurant is in boasts tons of free parking, a true delicacy for in-town dining. We chose to sit on the patio at DBA which had a pleasant breeze, and I cannot wait to visit the patio again when there is even more of a chill in the air. 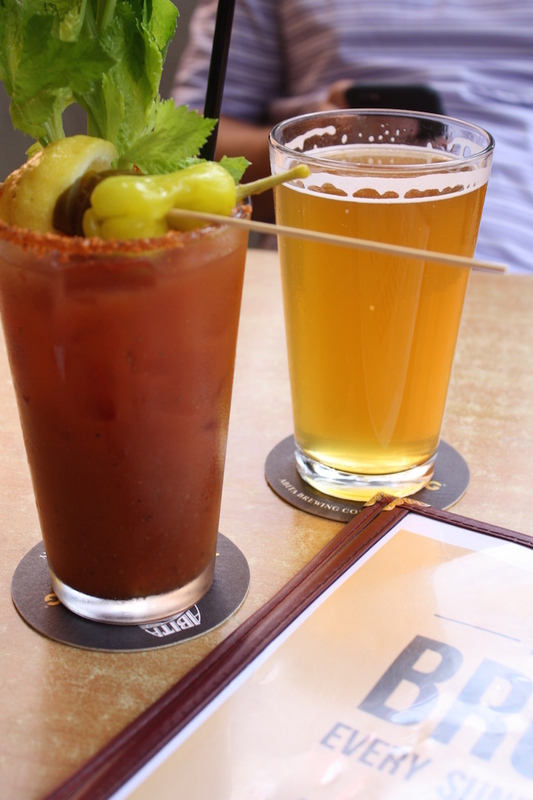 For me, Sunday brunch always kicks-off with a winning trifecta of beverages: a spicy El Diablo Bloody Mary, a Coca-Cola, and a water. I don't know when I started ordering my brunch bevs like this, but it's safe to say that it's the best combination out there. So good. Try it! Back to the El Diablo: I love a spicy bloody, and this one definitely fit that bill. Tangy and full of yummy spicy additions like pepperoncini, this drink is definitely being added to my list of best Bloody Marys in Atlanta. We then dove right into to ordering other goodies for the table starting with beignets. Covered in a snowstorm of powdered sugar, if these beignets were a sign of what was to come, we knew we were going to love our meal. Beignets are the perfect way to get a little bit of everything at brunch: a little bit of sweet with all of that savory. Yum! When our meal arrived, we could barely contain our excitement to dig right in. Of course I had to hold Hunter back while I snapped the necessary shots of these plates of delicious BBQ-inspired brunch choices. This time it was fried green tomato and ham Benedict for me, and brisket hash for him. The ham on my Benedict was incredible. It was layered on top of Challah bread along with a crispy fried green tomato and finished with a perfectly poached egg and delicious cajun hollandaise. My mouth is watering at the memory of it. The hubs loved his hash too...so much so that if I remember correctly, I was barely able to sneak in a bite. We left DBA Barbecue that day full and promising to return. Not only was the meal absolutely wonderful, but the staff was personable and attentive which to me, is the mark of a truly great restaurant. I can't wait to bring friends and family back to the patio for another round of El Diablo Bloody Marys. Maybe you can join me?! YUM! This place looks delicious!